Plot Aliens, contacting scientist Adam Penner, inform him that they have been on the moon for twenty thousand years, undetected due to their invisibility, and have now decided to annihilate humanity unless all the nations of earth surrender immediately. Sequestered in an impregnable laboratory trying to find the aliens' weakness, Penner, his daughter, a no-nonsense army major and a squeamish scientist are attacked from outside by the aliens, who have occupied the bodies of the recently deceased. I was looking at my movie shelves and Invisible Invaders caught my eye. It took me moments of hard thinking to figure out if I've seen it or not. Then it hit me--this is the science fiction story in which invaders take over the bodies of the dead and proceed to a local ice hockey game to threaten all of Earth in surrendering. At barely over an hour, this is one dull movie if you only take it at face value and never stop to consider what you're actually seeing. That's when the entertainment kicks in. 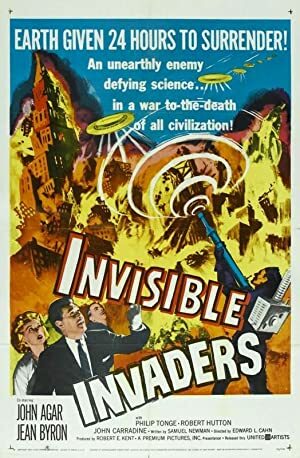 The invaders are, as the title suggests, invisible. Why do they need to inhabit dead bodies and make themselves vulnerable to attack? Why announce your demands at a hockey game? Later, the invaders do the same at a stadium, but this is also after they give Earth "just one more chance" and issue an ultimatum. By that point, it's more like three chances. How come the leading man (John Agar from Revenge of the Creature from the Black Lagoon and The Mole People) doesn't come into the story until nearly the halfway mark? How come the other leading man, seemingly honest and dependable, freaks out and tries to kill everyone? How come all of the invaders sound like John Carradine? Granted, one of the invaders does possess him but a later seen invader talks in his voice. This is but a sampling of the multiple "wait what?!" moments that are peppered throughout. It's a hoot. There are genuine positives to be had. 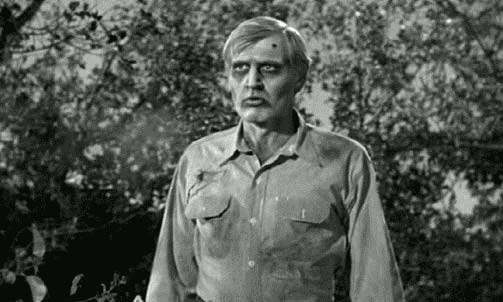 For example, the possessed deceased are called "the walking dead" and do bear a resemblance to the zombies seen nine years later in Night of the Living Dead. 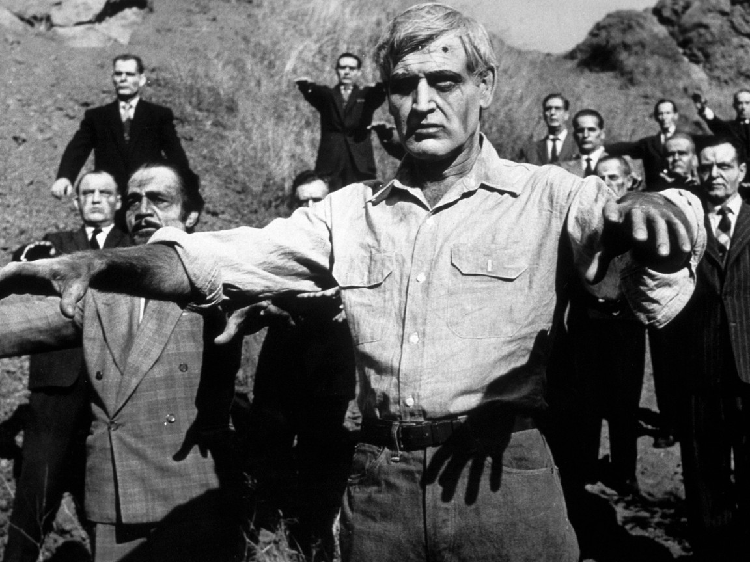 The shots of the ghouls shambling down the country side is eerily similar. Also, the military (one officer) and some scientists hold up in a cave while trying various methods to stop the space invaders and their rotting hosts. Although not exactly the same, it's easy to draw a parallel to Day of the Dead. Of course, Invisible Invaders is not the only aliens-use-Earth's-dead-to-take-over picture from 1959. It's also the year of Plan 9 from Outer Space. Which is the better of the two? Invaders is more slick and better crafted on the surface, but it's illogical moments rival most of anything from Plan 9. It's a toss-up.